If you’ve been reading this blog for any amount of time, you’ll know that I’m really into my tech, so much so in fact, that Dave regularly takes the mickey. The number of devices I have to charge or link up to Bluetooth when I’m riding or working out is pretty daft – I’ve got Powertap power pedals, an electronic groupset, various different cycle computers, a Wahoo bluetooth heart rate monitor, a Wattbike, several fitness tracking watches… the list goes on. Then there’s the assorted cameras, phones, gadgets and gizmos I use for filming. Whenever I travel, I have one change of clothes and fifty million chargers. 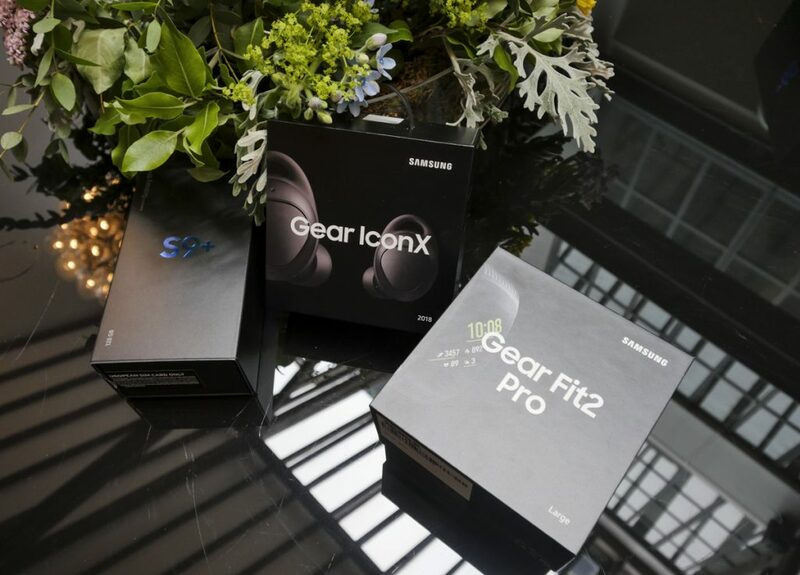 So, I was excited to receive an invite to Samsung’s House of Wellness where I’d be immersed in the company’s new tech and given the opportunity to test out the Samsung Gear Fit2 Pro Fitness Tracker, wireless Samsung Icon X earbuds (headphones) and the new feature packed Galaxy S9 smartphone. 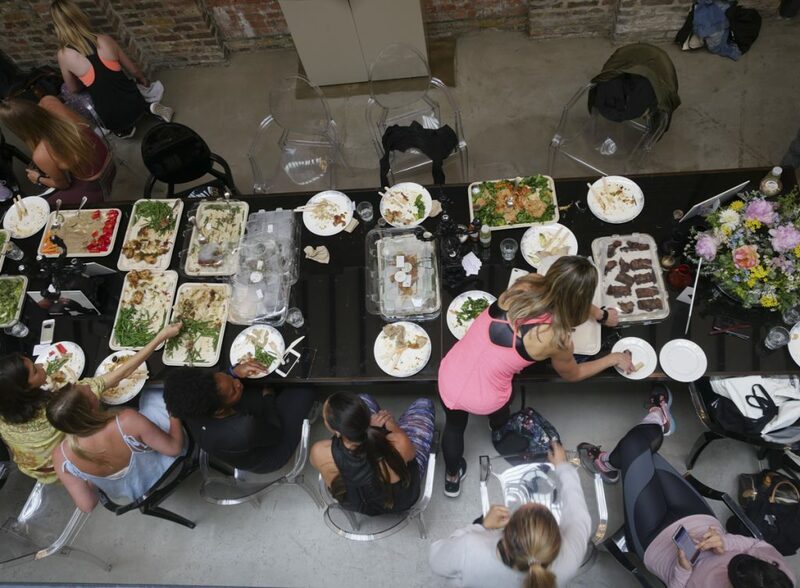 The day was an opportunity to discover how wellness can fit around any lifestyle and goal – and how Samsung’s wearable devices can help you monitor, achieve and smash your targets or simply make the journey more fun, something I can definitely get behind. I’m just going to give you a brief run down of what we got up to and a first look at the devices – I’ll follow up with more in depth reviews once I’ve had a chance to use the products for a decent amount of time. Over a light breakfast, we began the day by unpacking our devices and getting them set up. As I was a little late (thanks Great Western Railway) I was worried I wouldn’t have time to get everything connected and usable before we were whisked off for our yoga class but it took about ten minutes to transfer everything from my old phone to the Galaxy S9 and add the phone and earbuds. So far, so good – no matter how much I like tech, fiddling around initialising new devices can sometimes be a pain, so I always appreciate intuitive, fast set up. 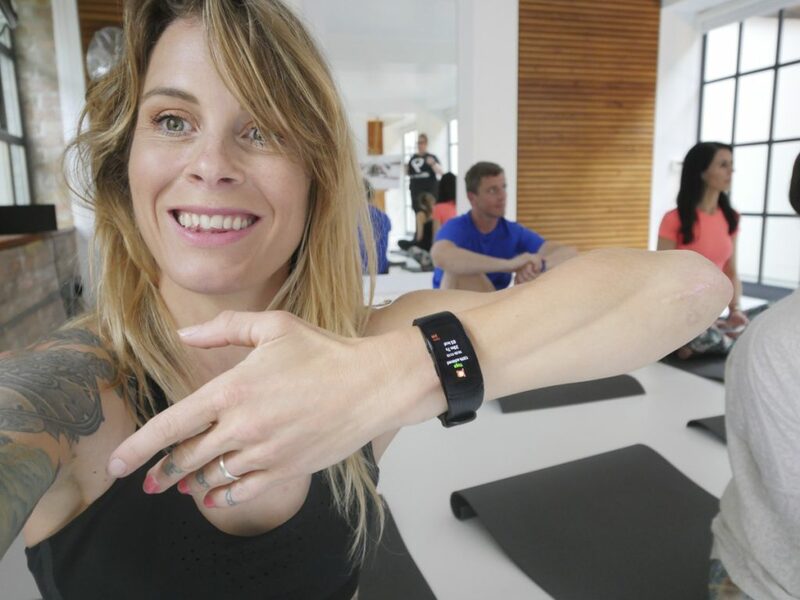 We began with a yoga class, which was a good opportunity to use the Gear Fit2 Pro – the slick looking fitness band come pre-loaded with different exercise options so you can select what you’re doing, choose a target of say, time or distance then record your workout. We were lead through a great session, something I really needed as I’ve been suffering from a fair bit of stiffness since my crash at Red Hook Crit in April. Heart rate is displayed and the device buzzes when you reach the target you’ve selected or you can just set the device recording and get on with it, like we did. Alongside the various workout modes, the device also counts steps, floors climbed, calories and all that jazz, but the real boon for me is it knows when you’re cycling and records it as a ride, rather than thinking you’re just doing a hell of a lot of steps. As it’s waterproof it can also be used to count lengths whilst swimming, so I’ll definitely be testing that and including my findings in my full review. 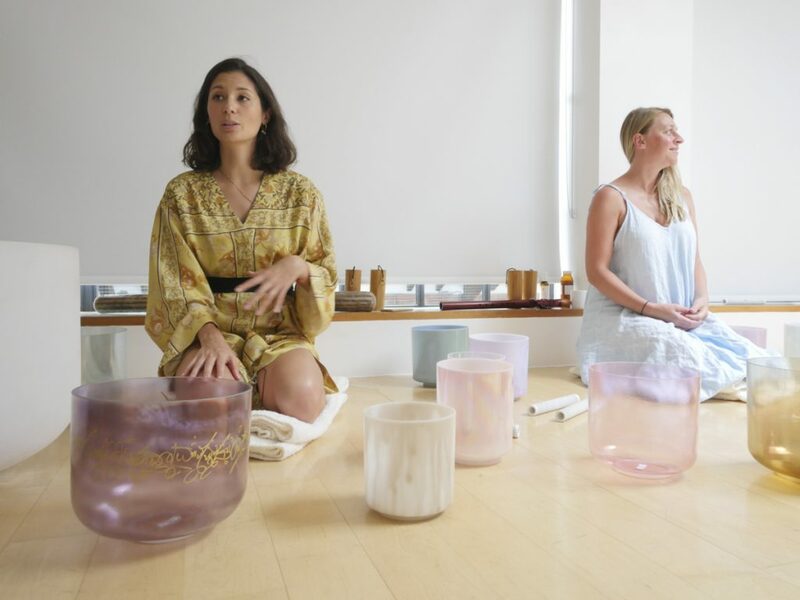 For our next experience at the House of Wellness we settled ourselves down for a gong bath with Sound Sebastien. Obviously, I was clutching the Samsung Galaxy S9 smartphone as I was keen to get photos – the huge screen and dual aperture camera is going to be handy for blogging and social media and the super slow-mo is definitely getting used next time I’m judging the finish of a race. The built in heart rate monitor on the rear is really neat, particularly if you don’t have a smart watch or aren’t wearing it so I measured my pulse to see how relaxed I was before the session, hoping to see my heart rate fall after half an hour of pure relaxation to the soothing sound of singing bowls. After trying to calm my crazy brain and zone out (not something I find particularly easy!) I took my pulse again and checked out the Samsung Health app. Along with my penchant for tech devices, I’m also really into analysing results and tracking progress – I already use Training Peaks and Strava, amongst others – so the detail and clean, simple layout appealed. I was able to see heart rate trends, something I’ll definitely find useful as I like to track my recovery in this way. You can also add in Third Party apps, though sadly there’s no sign of Strava or Training Peaks – it would be nice if you could integrate everything and have it one place. After a brief cooking demonstration (in case you didn’t know how to make an omelette, ha!) it was time to check out the Gear Icon X wireless earbuds, something I was pretty excited to do. I’d been looking for a wireless headphone solution for sometime, seeking something that I could use independently of my phone when I’m out riding or training. These little nuggets looked promising. 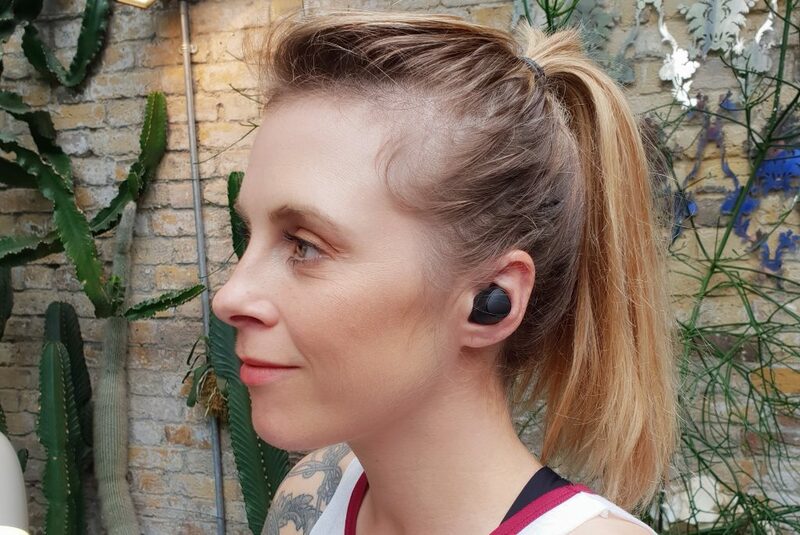 What’s great is that you can adjust the volume in each ear independently, which is really useful as I sometimes like to listen to podcasts or music in just one ear when I’m cycling, so that I can hear traffic in the other. Set up and adding music is done via a clean, user friendly app, you’ve got seven hours of playback on a full charge and these babies can even track your walking or running and deliver coaching instructions. The ‘buds are a soft silicon that feels comfortable in the ear and they seemed pretty secure when I jumped around doing burpees to try and make them fall out. Unfortunately, losing them is my main concern because I am really, really good at losing stuff but I’m going to try really hard not care for these little beauties and make sure I store them securely in their charging box every time I remove them from my ears. As ever, full review coming soon. And with that, we wrapped up our day – I toddled off to my second yoga class of the day at Lululemon before heading to the lovely Shoryu Ramen in Kingly Court for some spicy vegetarian noodles. A day well spent. Thanks Samsung! .Previously What should I eat for bike racing?